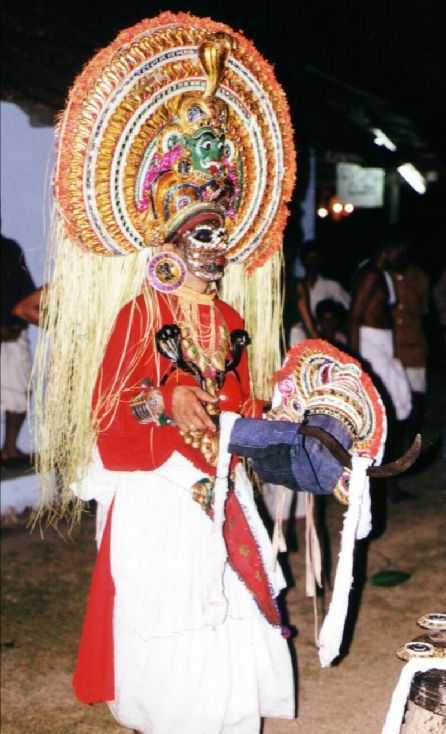 Once the Asuras took refuge in Paathaalam and disappeared from the battle field Kaali becomes ferocious (kali ilakuka). Koyiamptar gets hold of Kaali, takes off her head gear and forcibly makes her to touch the ground with the sword in order to calm her down (kali irakkuka) or else she might become more destructive. Daarika and Daanavendra were capable of performing illusory battle (Maaya Yudham) during night and waited for sunset. Knowing this, Kaali concealed Sun by her long hair causing false sunset. Mistaking this to real sunset, Daarika and Daanavendra returned to the battle field and was defeated by Kaali. After killing both the Asuras, Kaali blessed everybody and disappeared. All the viewers leave the scene after `Pantham Uzhiyal', but the person who offered the performance stays back along with his kith and kin for the next rite - Mudi Uzhiyal. 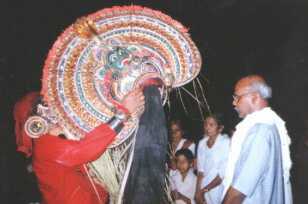 Kaali takes off her head gear, encircles it near the face of the person and his family members thrice, offers Prasaadam (again the flowers from the garland on the head gear), receives `Dakshina' (supposed to be the reward for the performance) and concludes the ritual.